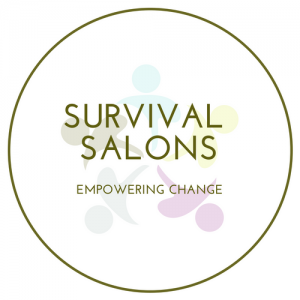 Survival Salons are small gatherings of ‘civic changemakers’. Our “Why” is to create communities of like-minded people who want a better future for our children. In a Blog post entitled, “Nothing Changes Until We Do” I addressed the challenges of choosing, navigating and sustaining change in our personal and professional lives. The key to success is creating safe spaces and peer relationships that offer continuing support. And when we become more confident and self-assured, what often follows – in this life stage or a later one, is the inclination to speak out about the systemic and cultural dis-ease that undermine well-being for us all. For some examples of what that might look like, you can learn about some ordinary citizen-activists profiled here- On Echoing Irish Voices Congruent with Irish Values. 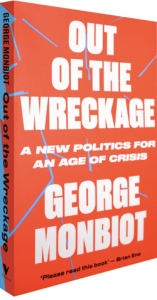 Out of the Wreckage, a New Politics for an Age of Crisis is author George Monbiot’s analysis of how we arrived in this age of despair for all but a few. Shared values are the foundation for our individual and collective efforts. Next, we write a new story. This becomes the map we follow moving forward. We tell a new story of excellence across the island of Ireland. Worthy leadership which can drive and support a radically reorganised democracy which serves the entire population and not just a privileged few. Individuals and groups will have very different goals and purposes. But by creating a fellowship of change-makers building on a foundation of agreed values, we will move forward on parallel paths – having replaced despair, and our collective sense of alienation, with a confident sense belonging and shared purposes. Here in Ireland, both in Northern Ireland and the Republic – we are facing a crisis of leadership. Nearly 2 years without a government in Northern Ireland – and facing major Housing, Homeless and Healthcare crises in the Republic – outrage via #Hashtag is not going to change anything! It is up to citizens to set an agenda for both our politicians and the civil service. So if #WeDeserveBetter, #EndCorruptionNow, #Transparency, #Accountability, #Brexit, #MyNameIs and others have gotten your attention – consider taking your concern off-line. A group of us will be offering an opportunity for you or your book club to join us via video conference or small gatherings to discuss “what’s next”. It may be something as simple as writing or visiting your MLA/MP, TD/Senator or MEP to advance your group’s agenda, to write stories that challenge the mainstream media narrative, host gatherings or organise events. Monbiot has generously included an outline of the way forward in the concluding chapters of the book. It’s best if we #DontGoItAlone. To learn more, schedule a gathering or join a video chat – please leave your details here. Beyond the book, there is an equally inspiring bibliography that holds a promise of a better tomorrow.